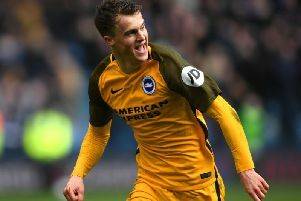 The German, 26, featured in every Premier League match during his first season in England, netting seven times and contributing eight assists as Albion finished the season in 15th. Gross joined from then-Bundesliga outfit Ingolstadt 04 in a deal worth £3million last summer. The 26-year-old's extended deal will now see him remain with the Seagulls until at least 2022. Gross said: "I think we had a very hard season and I'm very happy to sign a new deal for Brighton - it's a very special day for me. "We played a very good season. We stayed in the league, that was our big aim, and personally I was very happy I could help the team with goals and assists to stay up. "At the beginning it was not easy but after that it was what I expected and maybe a little bit better. You never know what can happen when you go to a new country but at the end I was very happy with my stats and everything went so well. I hope I can continue like this."